In the category manager it is possible to create complex hierarchical data structures which may be difficult to use with normal list fields. 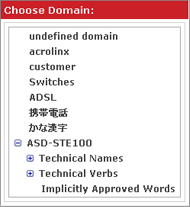 For example, when adding a domain in the term edit page, users may have to scroll through a long list field to find the correct list item. If you have categories which are organized hierarchically, you can configure the Terminology Manager to display all category fields in a tree view. The tree view for category-based fields is similar to the tree view used on the category manager page . In the tree view, the hierarchical relationships between categories are easier to see. 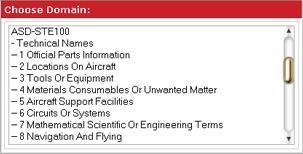 Users can also expand and collapse categories which contain many subcategories. Important: There are currently two usability issues to consider when configuring the tree view. First, the tree view is currently not available for category-based fields which appear in the term import wizard . Secondly, a category-based field can obscure the OK button in the filter menu when the tree view is fully expanded.